There are many types of celebrities in the world. There are the famous, the T.V. stars, the movie stars, Superstars, and even a few legends. Over the last week in London, my home town had the honour and privilege of hosting two events featuring an honest to goodness, true life Greek Geek God. The star of the Evil Dead Trilogy, its terrific ongoing spin-off show Ash Vs Evil Dead, Hercules, Xena, Brisco County Jr. and Sam Raimi's Spider-Man Trilogy shook hands, high-fived children and spoke to thousands of fans, including a certain chubby blogger that regular readers may be familiar with. In my capacity as freelance journalist I have been fortunate enough to speak to many celebrities who make their homes at various points on the star status list; this meeting was perhaps the most nerve wracking, hilarious, and surreal of them all. 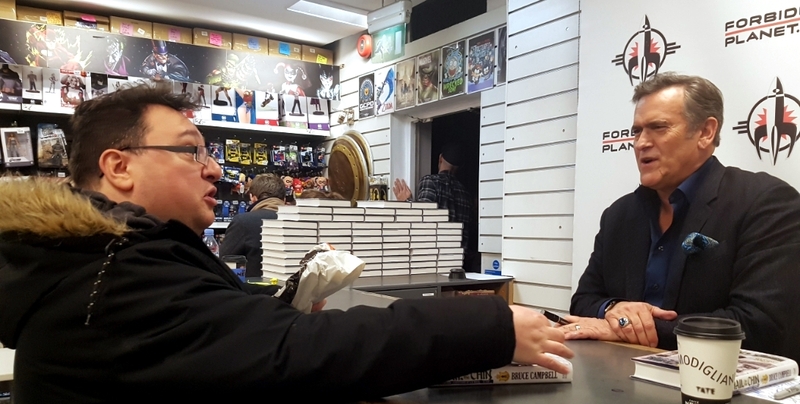 Over the course of March 10th and 11th Bruce attended the incredible Walker Stalker Con at London's Olympia, then on the 13th he was at the Forbidden Planet Megastore on Shaftesbury Avenue, signing his new book "Hail To The Chin." This is his second autobiography, and sequel to the best-selling "If Chins Could Kill." He was due to start his session at 6pm, but when I arrived just before 5 o'clock, he was already in full flow. He smiled, he joked, he winked, he laughed out loud. He spoke to hundreds of people, and I was fortunate enough to be one of them. I left the store well after 7:30pm, and the man was still going strong. So, without further ado here are the questions Mr. Campbell answered over the course of the two events, all in one place, and available NOWHERE ELSE. Fantastic Universes: Hi, and welcome back to London. We've seen a lot of you this year. BC: It's a great town, and they keep letting me back in. FU: (At this point I'm already trying not to laugh). You have a huge fan-base in the U.K. and it's so cool that you celebrate your Scottish heritage. Scotland certainly has its share of ghosts, ghouls, monsters and witches. 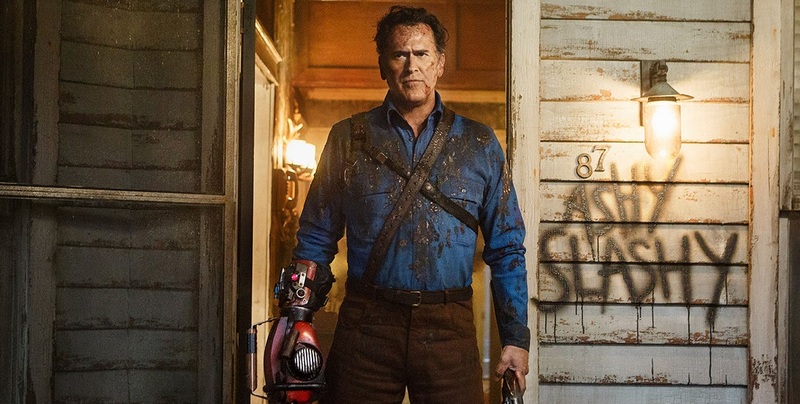 Do you think we'll get to see any of those on (Ash Vs Evil Dead)? FU: You have to be! FU: This year marks the 40 year anniversary of Within The Woods (Bruce and Sam Raimi's first foray into the Evil Dead Universe, almost a demo of the original, made to get the first movie funded) and 31 years to the day that Evil Dead II was released. How does that make you feel? BC: It makes me feel old! BC: I'm happy that I'm still here. Who knew that after all this time I'd still be getting this kind of mileage from that character? FU: At Walker Stalker Con last week, you said that the idea for Negan's baseball bat Lucille (from The Walking Dead) was actually yours. BC: Are you Walker Stalking Me? BC: It's a fact, Jack. I should be on the payroll for that show! FU: Can you tell us what to expect from the rest of season three? BC: As long as you make sure that you watch it! BC: (He gives me his classic, copyrighted glare and half smile.) You've seen Army Of Darkness, right? BC: The end of Season 3 is gonna blow your mind. Think Army Of Darkness and time travel. FU: So, over the years you've probably been asked all kinds of questions. Is there one you always wanted to be asked but never were? What is that question, and what's the answer? BC: Over forty years I've been asked all the questions! Ones I wanted to answer, some that I didn't, and even more that shouldn't ever be asked! BC: That's why I write the books. FU: You certainly did. Thank you so much. BC: (He grabs my hand and gives it a strong, firm, but friendly shake.) Take care. Enjoy the book. Whether you've read "If Chins Could Kill" or not (Please do, you won't regret it), "Hail To The Chin" is a must read sequel. If you think the conversation above was good, the book is all that x1000! Having attended the signing I am fortunate enough to own a signed copy of the limited U.K. & Ireland Tour Edition, but the standard hardback, and audio version (narrated by the man himself) are available everywhere, including Forbidden Planet, Audible, Amazon, Google Play Books, and other smartphone platforms. Remember to shop Smart, and don't read any of the passages out loud... just in case. Please Support Ash Vs Evil Dead by watching live on the Starz Network in the U.S. and on Virgin On Demand in the U.K. YES I own a copy of Spider-Man 3. Why? 1. I am a nerd completist. 2. It's not Sam Raimi's fault, it's Sony's (Just my opinion, please don't sue). 3. 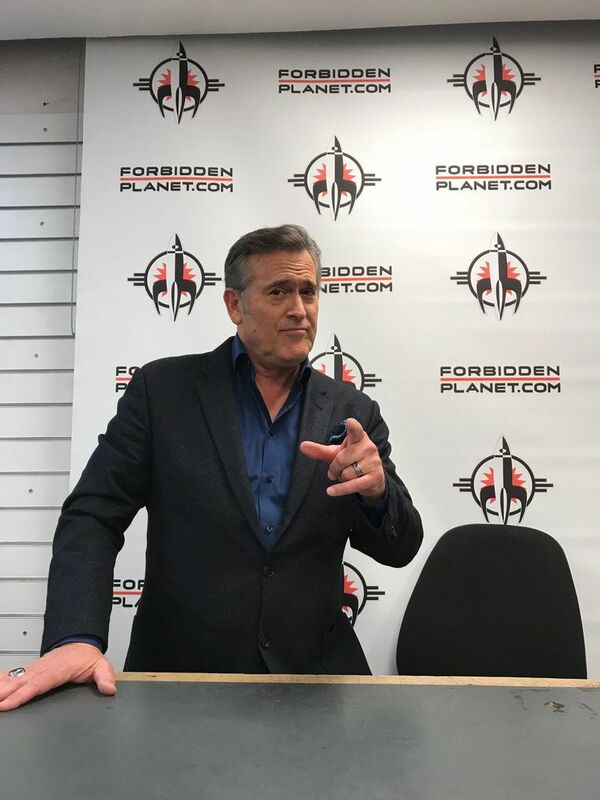 Bruce Campbell's in it. 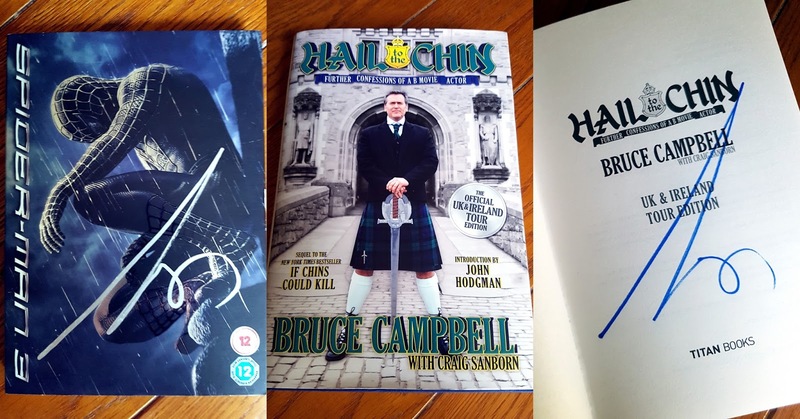 Why, of all things did I ask Bruce Campbell to sign THAT?!? 1. 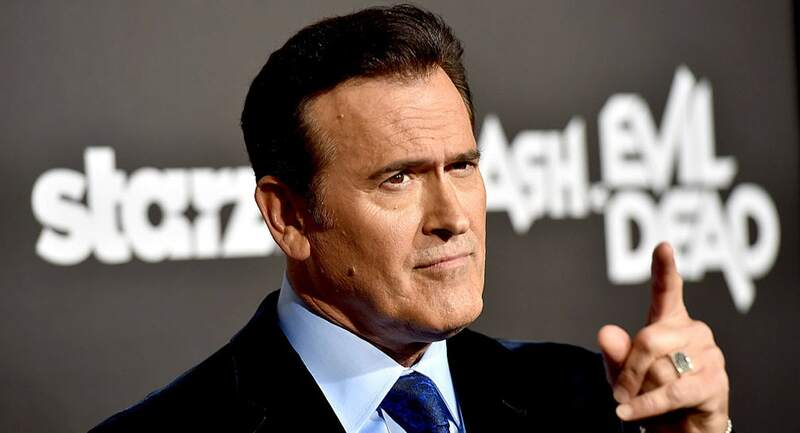 Bruce Campbell's in it. 2. The other two Sam Raimi Spidey movies ROCK. 3. Bruce Campbell's signature has elevated the status of my copy of this DVD from "Meh" to "Groovy." Nicely done, senor. I can only imagine how this must have felt. He is certainly one of those fellows i would love to sit down with and have a good chin wag. And what he said about the end of season 3 sounds...well...to quote the Almighty Ash...GROOVY. Keep up the sterling work my friend. Thank you, my brother. This whole experience was a dream come true.